As the storm moved through the skies above us I overcame my awe and grabbed my camera and tripod. I set the camera at f/16, ISO 100 and a shutter speed of 30 seconds. With my camera on a tripod I tripped the shutter and waited. 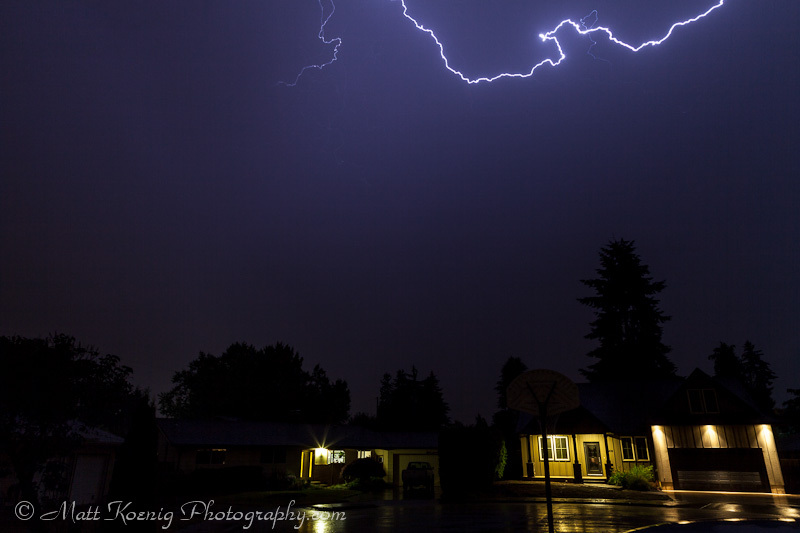 My very first shot was this horizontal bolt across the sky. I was hunkered down under the overhang of the roof and the rain was really coming down now. Water was starting to soak my camera as the lens was aimed up at the sky. I shot several more 30 second exposures but only the first image captured any lightning. Next time a thunderstorm rolls through you can bet I will be out trying to capture the lightning and enjoying that cool fresh rain smell. Wherever you may be and whatever you may be doing… Happy Monday! Nice shot, I always keep my shutter open too long and I don’t get the contrast in the sky. Thanks! I got lucky on this one. Wish I had been able to capture more. How long are you leaving your shutter open for?